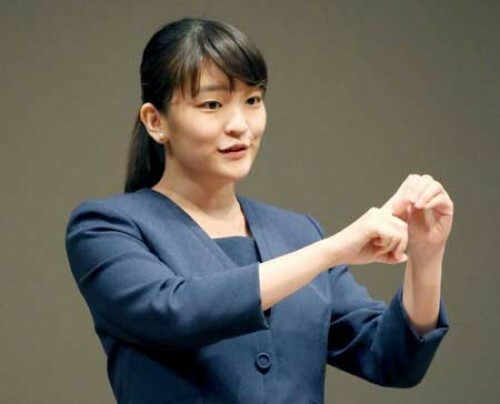 Tokyo, Sep 3 : Princess Mako, the eldest grandchild of Japanese Emperor Akihito, officially announced her engagement with Kei Komuro, a former university classmate. Mako and Komuro, both 25, expressed great joy over the engagement and Emperor Akihito's approval, during a press conference held at Akasaka Palace in Tokyo. Mako said she felt truly happy when he proposed a marriage in late 2013, while Komuro said he was aware of the responsibility that entails and expressed his desire to create a harmonious family. Both met in 2012 when they were students at International Christian University in Tokyo and said they had been dating for about five years. The official announcement of the engagement had been scheduled in early July after the Japanese media were reporting about them in mid-May, but the Imperial Household Agency decided to postpone the event due to torrential rains that were striking southwestern Japan. The princess works as a researcher at a Tokyo museum, while Komuro, a resident of Yokohama city, south of the capital, is a legal assistant and undertaking a Master's degree in business law. Mako is the eldest daughter of Prince Akishino, the second son of the Emperor and second in line to the Chrysanthemum Throne after Prince Naruhito. Mako's marriage will further shrink Japan's Imperial family, an aged and dwindling institution heading towards a huge generational gap. The marriage could also reopen debate on the law that has been governing the royal household since 1947 that doesn't recognise the so-called collateral institutional branches, resulting in women who marry out of royalty to lose their royal status.